I figured that the best skiing anywhere around here was still on the south side of Mount Baker, but I needed a change of scenery after 4 trips up the Squak Glacier in the last month. How about the Easton Glacier instead? I've skied that 3 times this year too, but not since late June. And the Easton route is much more scenic in late season, with the approach hike up the knife-edge crest of the Railroad Grade moraine, looking across at the icefalls and bare blue glacial ice, always a thrill for a glaciophile such as myself. I was unsure of what the crevasse or snow conditions would be like on the Easton, with no recent reports at all, but if things looked bad on the ascent, I could always just ski down the Squak route again instead. 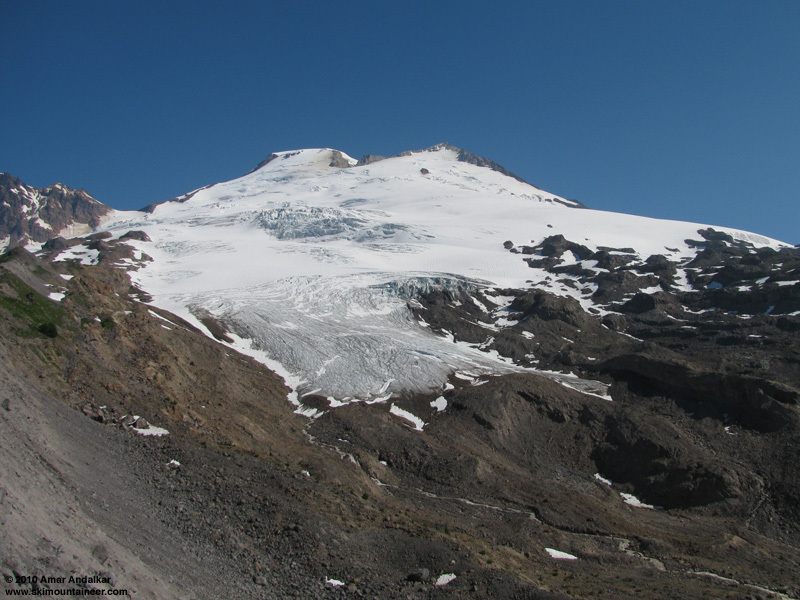 With the heat-wave ending and onshore flow beginning, freezing levels had dropped to 13000 ft by Wednesday from the 15000+ ft of the weekend (see August 15, Squak Glacier), with overcast skies and a marine layer of clouds filling the lowlands up to about 1000 ft elevation. Got a late start from Seattle, and finally left the sunny and nearly-bug-free trailhead at 9am, heading up the Park Butte Trail. A seasonal plywood bridge is in place over the main Rocky Creek channel, avoiding what would have been a very cold and wet ford. Just before the Railroad Grade Trail junction, I felt a sudden searing pain from the inside of the joint on my right middle finger -- what the #$%&! It must have been a bee sting, but how it got to the inside of my finger while I was holding my ski pole grip and hiking is a mystery. The pain and throbbing lasted for quite a while, but an increasing onslaught of annoying orbiting black flies kept me moving quickly up the trail. I would suffer from a headache the entire rest of the day until late evening, despite my typically ample hydration, and the bee sting was probably the culprit. 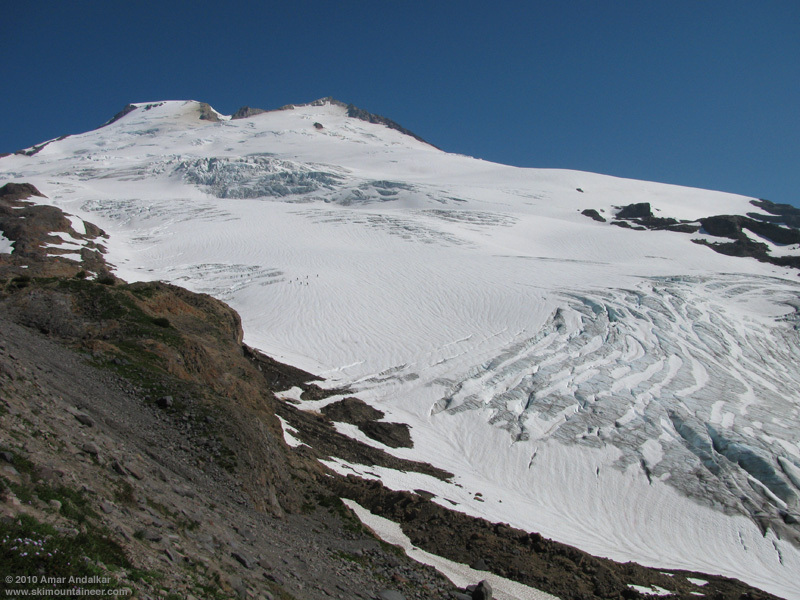 The Easton Glacier's terminus from the Railroad Grade moraine. Lots of climbers were heading out down the trail this morning, I passed 15-20, many of them expressing surprise and even awe at the unexpected sight of a skier: I would be the only skier on this side of the mountain today. As I reached the crest of the Railroad Grade and got my first view of the Easton, I was surprised and disappointed by how little snow there was on the lower Easton: the glacier tongue was entirely bare blue ice for several hundred feet above its 5400 ft terminus, with only a narrow finger of snow extending down along its left side. Definitely not worth skiing that, especially with no good exit from the bottom of the finger given the horrendously loose moraine wall. The standard Easton climbing route, heading up and somewhat left, looked like it might have some crevasse issues too, although I knew firsthand from my prior Squak trips that numerous climbing parties had been summiting via the route. Looking at the Easton Glacier from 5900 ft, at the route across and then up the smooth slopes on the far side (note 6 climbers at center, practicing glacier travel). But while hiking up the moraine, I came up with a much better alternate plan: get on snow at the first spot which offers easy access from the moraine to the glacier near 5900 ft beside Sandy Camp, then skin a rising traverse across the Easton's tongue on a smooth uncrevassed plateau above 6000 ft, then head up the eastern edge of the Easton where it seamlessly melds into the Squak. 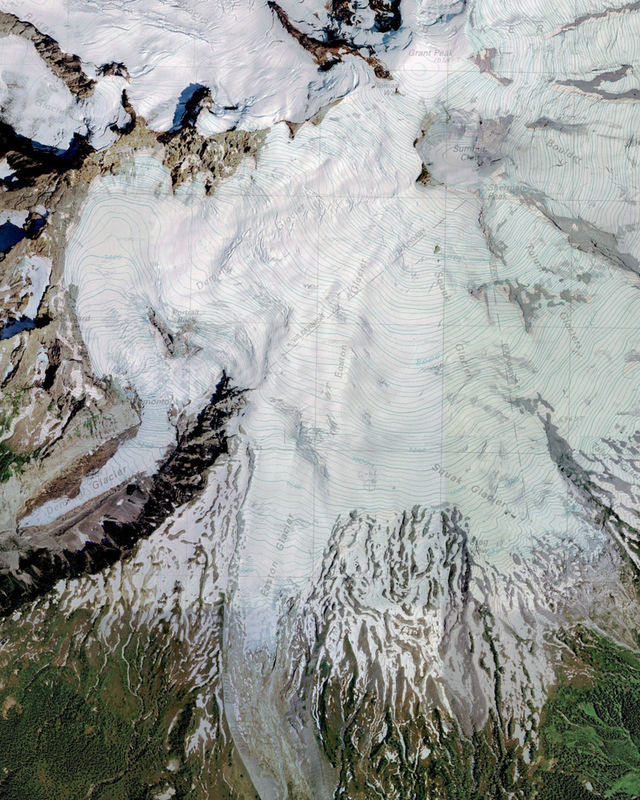 This area is clearly the least crevassed section of glacier on the entire mountain, a smooth wedge between the faster-flowing ice streams of each glacier. It's a standard snowmobile corridor in winter, and it offered a safe option for me being solo. The smooth route up the Easton-Squak Glaciers. This worked out well, the route went with minimal crevasse issues, even less than on the lower part of the Squak route right now. Although my constant headache remained, a nice downslope breeze kept things cool. 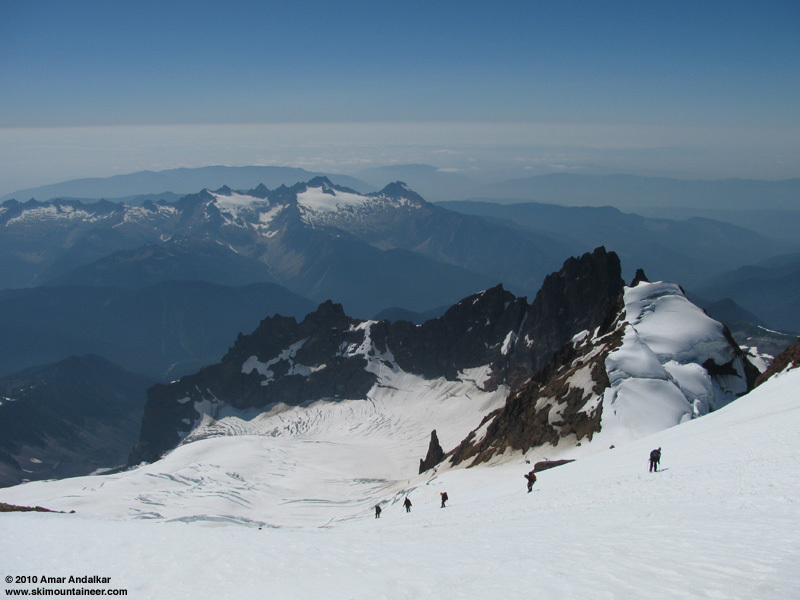 This route joined the Squak Glacier route near 8500 ft, just below the end run around the crux crevasses, roughly where the "Squak" route actually crosses onto the Easton Glacier for the rest of its ascent to the crater rim. Our skin track from Sunday up the Roman Wall had almost vanished completely from 3 days of sun and heat, but putting in a new one was easy enough in mid-afternoon despite the throbbing headache. A large group of 3 rope teams was very slowly descending the face as I skinned up, they had left camp at 5900 ft at 5:30am and taken about 8 hours to summit, and it looked like it might take them nearly as long to descend. I topped out on Grant Peak at 2:50pm, and although the top of it was now entirely bare, there was still snow within about 1 vertical foot of the summit. 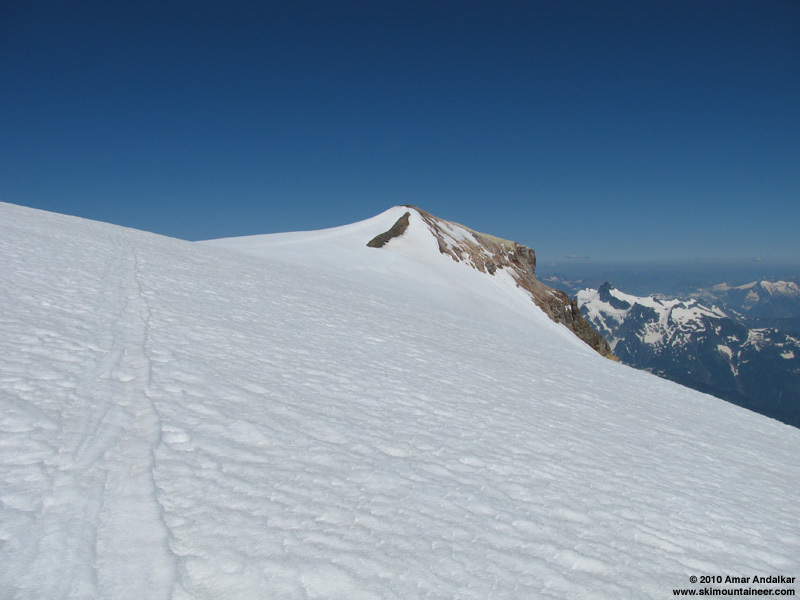 Our skin track from Sunday still remained, traversing the edge of the summit dome towards Grant Peak, with Mount Shuksan in the distance at right. A 15 mph NW breeze combined with a temperature of 39 �F made things quite cold on top. I took a few photos, then did a quick standing changeover, ripped the skins, and skied down at 3pm. 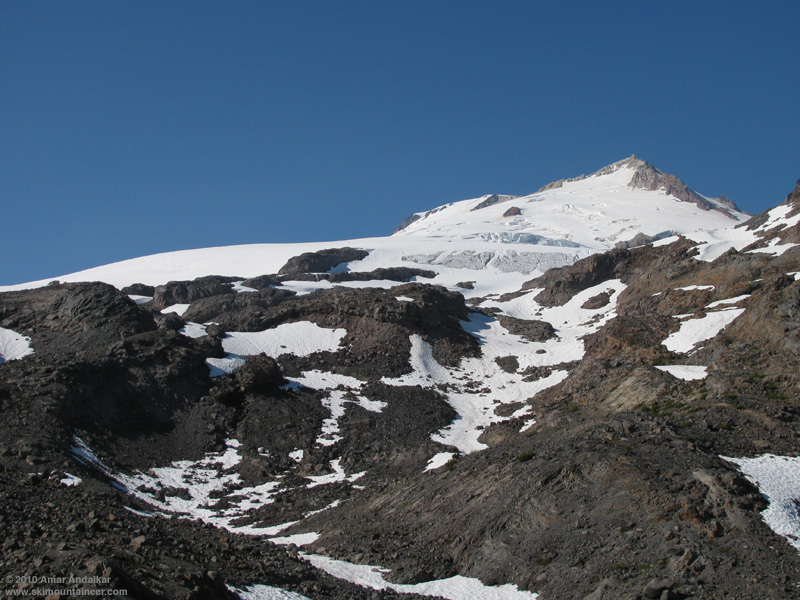 The uppermost NW-facing aspect of Grant Peak was still frozen, as was the traverse around the margin of the summit dome, making for a quick schuss. Dropping onto the Roman Wall was perfection though, the recent new snowfall had finally consolidated into superb smooth corn, and the outstanding turns continued for several hundred vert down the face. These were easily the best August ski conditions I've ever had the joy to experience, as good as any corn can be anytime, but unfortunately for too short of a stretch. Smooth corn at 10600 ft atop the Roman Wall, with the Black Buttes, Twin Sisters, and Puget Sound far below. Then the usual section of dirty and bumpy snow near the bootpack, avoiding the numerous large crevasses which nearly span the lower portion of the Wall. And then more fine turns below, the snow quality and smoothness were still holding strong despite the recent heat wave and intense sunshine. I had finished my entire 2.5 liters of water by the summit, trying in vain to make the headache go away (in case it was dehydration-related), so I took a long break on the flats at 8400 ft to melt another 1.5 liters on the Jetboil and eat a late lunch. Then back on skis and heading due south, aiming for the slopes directly below this portion of the glaciers, which looked to offer a long run on fingers of snow extending down through a series of moraines. 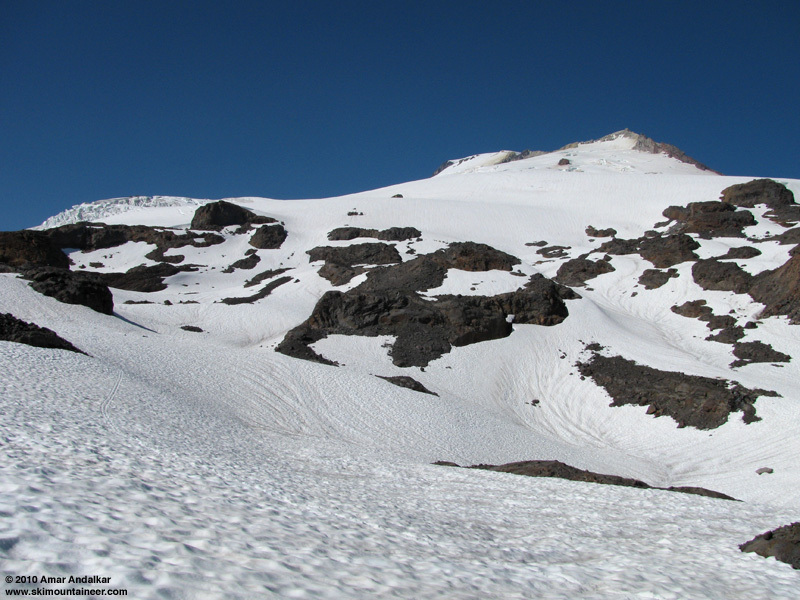 The upper basin below the Easton and Squak Glaciers, I skied just right of the large rock outcropping at left. Skied the steep face just east of the prominent rock outcropping, which is normally a cliff of exposed blue ice by mid-summer, but still remains all snow this year. 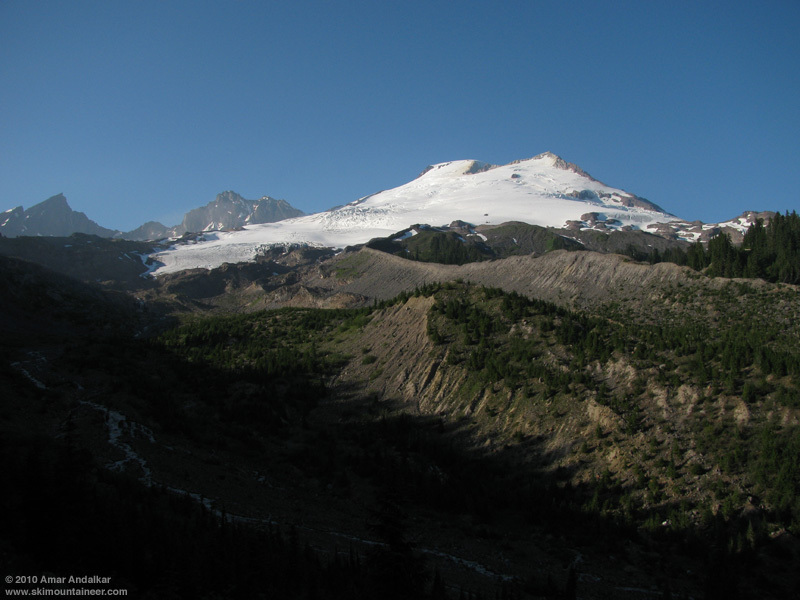 Then across the bowls and through the moraines below, angling farther eastward to stay on continuous snow, finally squeezing through a tight passage of snow above a rushing creek and down to 5550 ft. 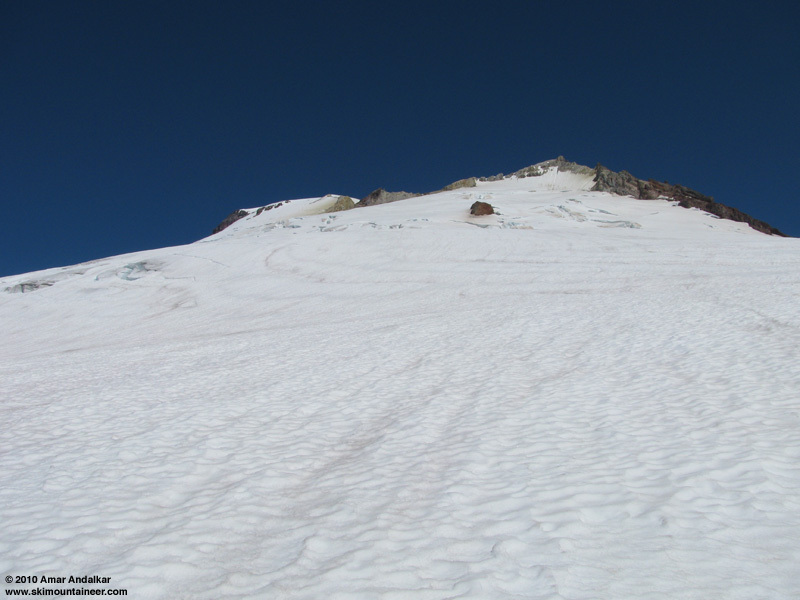 I had reached the opposite side of the same basin that I had skied down into from the Squak route 3 days earlier, except the heat wave had shredded the snowpack down here completely, forcing a halt over 300 vert higher than on Sunday. Looking up from 5400 ft at the lower basin below the Squak ice cliff, with a lot less snow in it than only 3 days earlier. Switched back to hiking boots, then headed down the moraines and a long snow finger back to the trail. Having never hiked the western half of the Scott Paul Trail loop, I decided to go back that way instead of the shorter eastern way which I'd hiked too many times in the past month. A good decision, costing only an etra mile and a few hundred feet of up-down, with the reward of lovely meadows and numerous outstanding views of Baker rising above. Followed by a contour down and around Metcalfe Moraine, the eastern twin of the Railroad Grade, and then a quick traverse to a seasonal suspension bridge crossing of Rocky Creek at 4500 ft on the Easton Glacier outwash plain. The seasonal suspension bridge over Rocky Creek. I'd read that the bridge had just recently been installed for the summer, otherwise this portion of the creek did not look fordable, a milky grey-brown torrent several feet deep rushing through slick rock walls. 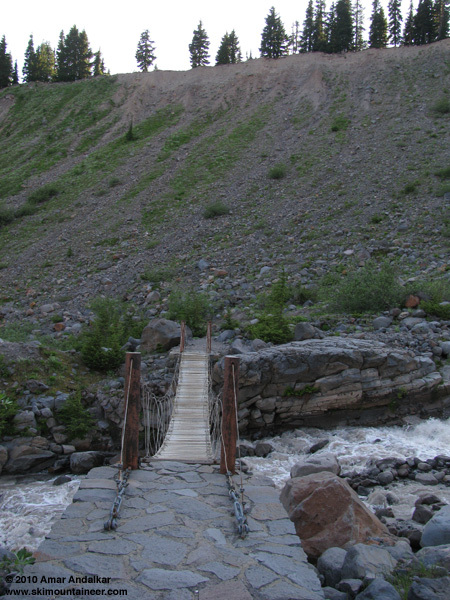 I expected a solidly firm structure (like the several Wonderland Trail suspension bridges), but was surprised to find the 30-ft long bridge swinging and bouncing crazily beneath my feet, a bit more fun on the crossing than I really needed after a big day. Awesome views of Baker, the Easton, and its moraines from this entire section of trail, crossing the floodplain where winter snows often lie 20-30 ft deep. But then still about 2.5 miles of trail left through the forest, rejoining the Park Butte trail and finally back to the car by 7pm. Looking back at Mount Baker from the trail exiting the Rocky Creek floodplain. A long and tiring and head-aching day, but so incredibly worth it for the exceptional scenery and excellent skiing. More than 8000 ft of total gain (lots of up-down on the trails) for just over 5200 vert of skiing, including the upper Roman Wall which held the best August corn I've ever experienced. Clearly 2010 has offered the best August ski conditions since at least 1999, perhaps in much longer than that, and we may not be lucky enough to see anything like it again for many years or even decades. That's why I keep going back and skiing Baker repeatedly, so that I won't have any regrets about missing out on this summer's unusual bounty, thinking back in some future August while staring at a field of menacing dirty suncups and trying to squeeze in some meager turns to keep the streak alive. When the skiing is this good, it's not just about "getting your August turns", it's truly an amazing experience that epitomizes everything that makes summer ski mountaineering so special. June 22, Easton Glacier Corn! Fantatic report! Sure appreciate all the pics and route details! !